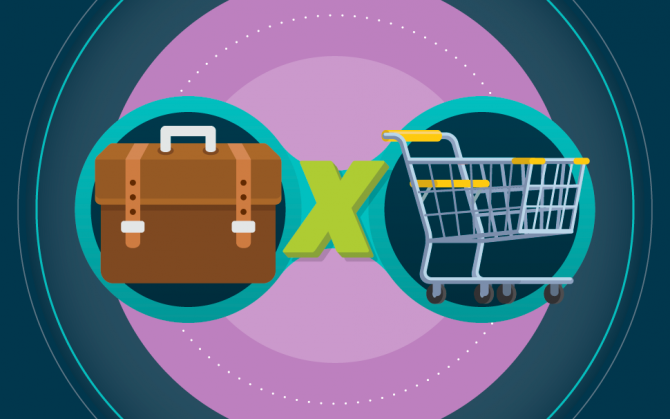 B2B and B2C: what is the difference between these two businesses? What is the difference between B2B and B2C business? Do you know in which of these business models your company fits? Learn more about their characteristics! The establishment of a new business is usually a time of uncertainty and self-doubt for most entrepreneurs. You need to study your market, identify your competitors, decide if you’ll need a physical space, if you’ll hire other professionals, choose the best marketing strategies, and establish partnerships with other companies, among several other important decisions. So, before you make these choices, you need to know who your target audience is. After all, understanding the profile of those who will buy your products or services will definitely make you feel more secure to define all of your sales actions. We’ve already talked about the importance of defining your buyer persona, which is nothing less than a buyer’s ideal profile. But, before you start analyzing your potential customers, you need to know if your business transaction model will be either B2B or B2C, and understand the main differences between them. If these concepts are new to you or if they seem complicated at all, don’t worry. We’ll explain everything in this post. Just keep reading it! B2C, or Business to Consumer, is what most people experience on a daily basis. This type of business is defined by transactions made between individuals and companies. In other words, we are dealing with a B2C business when we go to the supermarket, buy clothes on a store at the mall, hire a service online for our home or choose a gift on an e-commerce website. Overall, we can say that in B2C purchases, emotional factors tend to influence the decision-making process. Emotional advertising during the Holidays, the ad that shows delicious food, the outfits that are supposed to make you more elegant and attractive. All of this influences consumers in their purchasing decisions. Would you like to see a few examples? You walk by a bakery, smell freshly baked bread and can’t resist temptation, right? Perhaps you weren’t planning on buying bread but the smell triggered a desire and you ended up going in to buy some. Or when you are watching a YouTube video before going to bed and you see an ad for pillows that promises to help you get better sleep. You automatically imagine yourself sleeping in that pillow and decide to buy it the following day. In both cases, emotional factors excelled the products’ functionalities. It wasn’t the ingredients the bakery used to make bread that made you crave it. Just as it wasn’t the pillow’s technology, fabric or foam that convinced you that it would be a good purchase. Therefore, the main marketing strategies used by companies to attract individuals aim to trigger a sensation or emotion. In the same manner, the most commonly used communication channels are word of mouth, flyers and email marketing, social media, blogs, YouTube channels, various magazines and traditional media such as radio and TV. However, it’s important to stress that even though they are often stimulated by emotional factors, consumers have been increasingly looking for more conscious and durable purchases. So, make sure to let your customer know about your technical and market differentials when you talk to them, okay? B2B, or Business to Business, are transactions made between companies. In general, they are purchases or negotiations related to a corporate need, in other words, of a group of professionals. A few examples of this model are companies that hire software and tools from other companies, suppliers of warehouse materials that provide office material to companies from time to time, motorcycle courier services that work for delivery companies, or even law firms that offer legal consulting to small entrepreneurs. Overall, these negotiations involve higher amounts and recurring purchases. Therefore, they require greater financial control and the analysis and comparison of data and benefits. In other words, the rational aspect is predominant in the decision-making process. Because they can be long-term relationships, the Customer Lifetime Value (CLV) is very important in this model. The company supplying the service or product will probably be dedicated to understanding the needs of potential customers and will stay in touch with them a lot longer as a means to convince them of all advantages being offered. Therefore, the conversion time of a sale is usually longer than in B2C. Content marketing strategies, inbound and outbound marketing are very efficient in this case since they offer quality information, clarify doubts and create a relationship of trust between professionals of both companies. On the other hand, the most used communication channels are email marketing or business emails, social media such as LinkedIn, landing pages, blogs, specialized magazines, phone or video calls, consultancies and meeting. 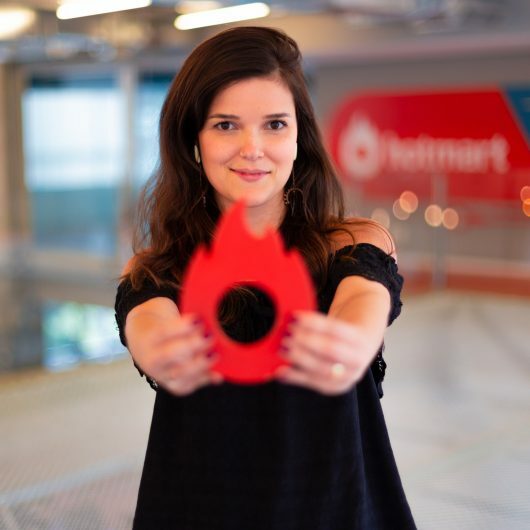 When it comes to Hotmart’s business environment, we can say that the relationship between Hotmart, Producers, and Affiliates is B2B, while the relationship between Producers and Affiliates and buyers of digital products is, in general, B2C. But there are also two other types of business that are becoming increasingly common: B2B2C and C2C. Would you like to better understand how they work? In B2B2C, a company communicates simultaneously with these two audiences mentioned above. In other words, it serves companies as well as end consumers. In this type of business, a B2B company, which is the supplier of a product or service, reaches the B2C audience indirectly, usually mediated by another company. Do you find this hard to understand? Let’s check out some examples! Online marketplaces are a form of B2B2C business. You have probably bought a product online on an e-commerce website, which in fact, was only managing the transaction between another company and you. And may have not even realized it then. Remember that appliance you bought at a multi-brand online store? Well, the supplier of the product is probably another company and the e-commerce website is merely mediating the purchase. In other words, this marketplace offers the sales platform so another company can advertise its products (B2B) and simultaneously, offer a showcase of products so that the end-customer can make a purchase conveniently and safely (B2C). In the same manner, we can say that physical stores or independent vendors that offer products as consignment sales are a form of B2B2C in offline transactions. And as we saw earlier, different audiences require different marketing strategies. In the case of B2B2C, the mediating company must adapt its actions to each of its audiences. In other words, with other companies, it will communicate in a different way as opposed to how they would reach the end consumer. It’s important to mention that the communication channels used by B2B and B2C might often be the same. However, the major difference is in how they are used, the language style and approach of the messages. C2C, or Consumer to Consumer, are sales between two individuals. This type of business is quite common in craft markets or websites selling secondhand items. In addition, social media has become an important communication channel between people who want to sell and those who wish to buy. In order to meet this growing demand, Facebook has launched a tool that facilitates business transactions between users of the platform. Always think of the customer! There are several differences between these business models, but as we can see, the main one is in the purchasing motivations of each customer profile. In B2C and C2C, customers are more interested in products and services that are directly connected to their desires and feelings. Even if these customers take into account factors such as price, features, and quality, what truly makes a difference is often an emotional identification with the brand. On the other hand, in B2B, the decision is made rationally in accordance with the needs of a group of people or organization. Therefore, it requires a longer negotiation process until the sale is made. Did you enjoy this text, and were you able to identify your company’s profile between the B2B and B2C models? Let us know in the comments below!